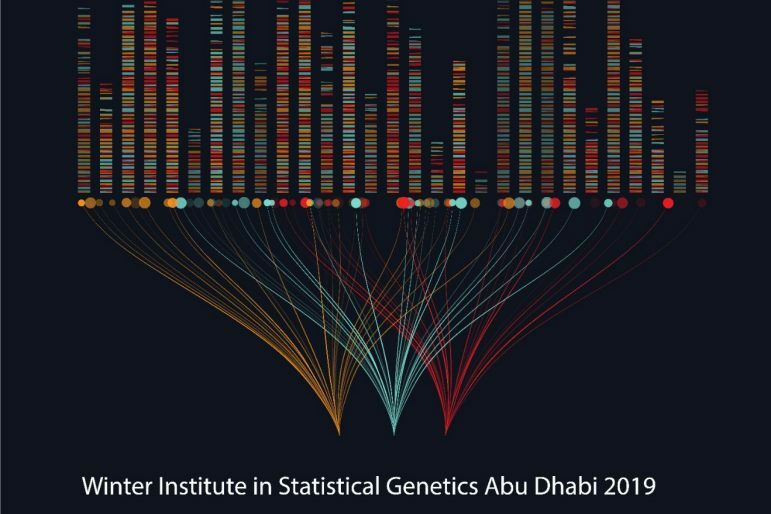 The second Abu Dhabi Winter Institute in Statistical Genetics will be held at New York University Abu Dhabi during January 20-24, 2019. The event has grown out of the annual Summer Institute in Statistical Genetics organized at the University of Washington. The event brings together a select group of statistical geneticists who are all leaders in the development of methodology in the field and have several years of experience in teaching statistical genetics and providing hands-on experience to the trainees. The workshops are designed to introduce students and researchers to modern methods of statistical analysis and to the challenges posed by modern genetic data. * Modules listed in Session 2 are concurrent. Therefore, only one module may be taken for this session. The daily schedule will be posted in December. This module introduces the R statistical environment, assuming no prior knowledge. It provides a foundation for the use of R for computation in later modules, including accessing the resources of Bioconductor and other open-source software. In addition to discussing basic data management tasks in R, such as using R commands to read in data and produce summaries, we will also introduce R’s graphics functions, its powerful package system, and simple methods of looping. Examples and exercises will use data drawn from genetic, biological and medical applications. Hands-on use of R is a major component of this module; users require a laptop and will use it in all sessions. This module focuses on the genetics and analysis of quantitative traits in human populations, with emphasis on estimation and prediction analysis using genetic markers. Topics include: the resemblance between relatives; estimation of genetic variance associated with genome-wide identity by descent; GWAS for quantitative traits; the use of GWAS data to estimate and partition genetic variation; principles and pitfalls of prediction analyses using genetic markers. A series of computer exercises will provide hands-on experience of implementing a variety of approaches using R, PLINK and GCTA. strategies as they impact inference of differential expression. Some discussion of single cell RNASeq will also be provided, as well as an introduction to eQTL analysis. The other half of the module will discuss how clustering approaches can provide a window into biological systems as well as complex diseases, and can be used to understand how biological functions are implemented and how homeostasis is maintained. We will demonstrate the leveraging of biological knowledge from gene expression experiments, and published data and knowledge-bases, in order to identify the pathways and disease sets associated with disease or an outcome of interest. The techniques discussed will be demonstrated in R and other computational tools. This course assumes a previous course in regression and familiarity with R or other command line programming languages. Users require a laptop and may use it in all sessions. This module provides an introduction to analysis of whole-genome sequence data. Topics include sequencing data structures, population structure and relatedness, aggregating and filtering variants using annotation, and association testing using single- and multi-marker tests. Concepts will be illustrated with hands-on exercises in R. Computational pipelines to link multi-step analyses will be presented, along with considerations for deploying these pipelines on a local compute cluster or in the cloud. After decades of scientific debate, a consensus has emerged that all human behavioural traits are partly heritable -- i.e., they are affected to some degree by random genetic variation within families. Furthermore, it has become evident that genetic and environmental causes of individual differences are interrelated. Thanks to rapid technological and scientific progress in the last few years, it is now possible to study the genetic architecture of social-scientific outcomes directly and to integrate the gained insights into the social and medical sciences. This module of the winter school will provide an overview of state-of-the-art methods that are used to study the genetic architecture of human traits (e.g. GWAS) and to use those insights in the social science (e.g. to study gene-environment interactions and to obtain more precise estimates of the effect of environmental conditions). The theoretical lectures will give plenty of room for discussions and will be accompanied by computer tutorials that focus on skills that are particularly useful for social scientists who want to integrate genetic data in their research (e.g. how to detect and control for population structure in the data and how to construct polygenic scores). **Module registration includes lunch, morning and afternoon tea/coffee break session, lunch and access to workshop resources.